The most commonly practiced form of publishing websites, which would be creating static html pages either by hand-coding or using HTML authoring tools such as Adobe Dreamweaver. These pages always contain the exact same information in response to all download requests coming from the users unless a webmaster uploads a freshly edited set of html files to update a website..
At the beginning of the 21st century, people with combined Graphic Design and elementary programing skills, called Web Designers, emerged to become the experts who have been supplying the demand for creating static web pages. Since then, Some grew to become major design firms and companies and they have branded themselves as the primary providers of all kinds of Internet Solutions. That is despite the fact that many still haven’t acquired the technical and software development resources to meet many of today’s dynamic and social aspects of Internet websites. Demand for webpages grew for marketing and information delivery purposes. 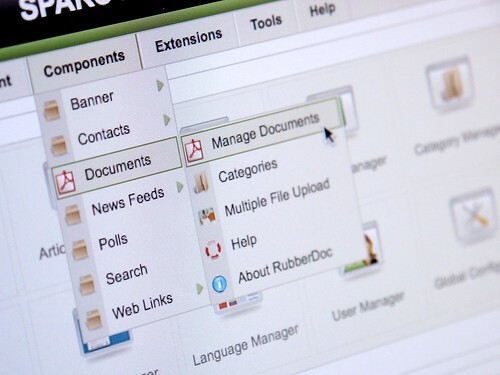 Web designers ended up having to maintain tens, hundreds, and even thousands of pages using their best HTML Authoring tools ( Adobe Golive, AdobeDreamWeaver, etc .) and that started to become such a painful job to do. These pages often had common elements such as headers, footers, and navigation links. Using web scripting languages (Perl or PHP) early web programmers and designers managed to automate reproduction of those common elements. For example they wrote scripts that could generate consistent headers, footers, or navigation elements throughout a website with thousands of pages. Updating a copyright notice on the footer was just the matter of having a programmer editing the code for the footer and then the entire site would be updated. At this stage Web Designers started developing slightly better programing skills ( or programmers developed better design skills) and that is when the first generation of “Web Developers” were born. The concept of web scripting was a great improvement, yet still couldn’t solve one major problem: content and presentation (layout, design, colors, … ) of a website were all fused together. Updating the content independently from the design and layout was nearly impossible without having to redo the entire website all over again every once in a while. Organizations and clients had to either hire a web master or outsource the content updated to outside web designers and web design companies. 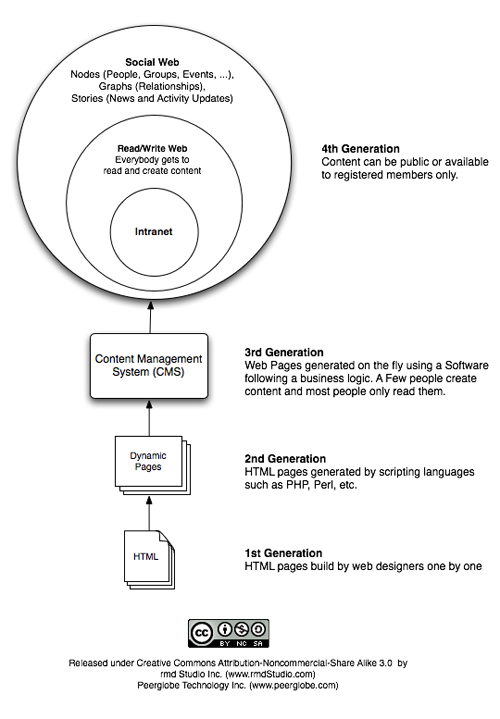 The 2nd generation websites still exist today in many prominent organizations, however with the advent of the Content Management Systems (CMS), many websites that are glued together by web scripting languages are being replaced by CMS powered websites..
A Content Management System is a software or web application used for managing, organizing, editing and publishing content. One doesn’t have to be a programmer or web designer to be able to use a CMS and that means people no longer have to outsource their content maintenance to a web design company. A CMS also stores and keeps the content separate from the presentation layer (Layout, Design, Colors, look and feel, etc. ) which will make it easier to redo the look and feel of an entire website without having to re-enter all the content all over again. When a user sends a request to the website to view a web page, the CMS obtains the content from the database, adds theÂ layout, look & fee, and colors to it, and then renders what we see as a web page. Managing and updating a content is done via an administration panel which operates more or less like an online word processor. One revolutionary aspect of CMS is the ability to collaborate and distribute the workload of the website maintenance and that means the concept of a Web Master is slowly being replaced by a group of people within the company collaborating to keep the website updated. This is both a blessing and a curse for an organization. For example the Marketing Department that generally has the final say on all the content that is being published is no longer able to re-enforce policies on a single Web Master and instead has to face being challenged by a team of content managers. Some marketing departments roll back to using older generation websites and outsource the work to an outside web design company to make sure nobody from inside the organization gets the opportunity to challenge their authority and monopoly. This is a short-term solution for them to maintain the status quo just a bit longer! One type of CMS which has significantly impacted our lives are blogs (i.e. WordPress.org). Blogs are better suited as broadcasting platforms in different media (text, audio, video) where the content is fresh today and not so fresh in a few days. Many companies are moving from timeless content towards blogging platforms where they can constantly update their audience about their latest activities and offerings and collect feedback in the same time. Blogs are basically a list of published content nodes that are organized using tags or in categories. People can comment on the published content and that creates a one-to-many or few-to-many conversation amongst the authors and readers. Blogs also create Really Simple Syndication (RSS) feeds that behave much like an antenna on a transmitter. Other RSS readers can subscribe to the feed generated by a blog. An Intranet is by definition a network which is only accessible to a specific group of users. Now if we make part of the content on a CMS available to the registered users only, we have created an Intranet. On a simple classic Intranet, often a small group of people are the content creators and administrators. 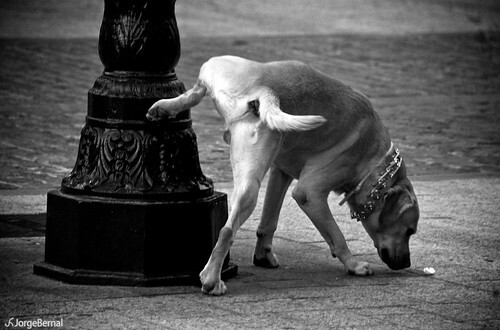 Sometimes stiff Access Control List (ACL) rules are applied to decide who gets to see what content. If all the people on this Intranet have both Read and Write privileges to collaborate on content development and maintenance, then we get ourselves a Read/Write Web platform which also known to us as a Web 2.0 website. Photo by Koke – reading and writing comments on each other’s spots! I believe sometime in 2004 Tim O’Reilly from the O’Reilly Media came up with a list of characteristics that defined a Web2.0 website, however I don’t think that they have invented the concept. I’d say they observed a inevitable pattern which was emerging in the course of Internet evolution and they did a fairly good job documenting it. Now imaging a read/write website and enable the users to connect to each other via what we call a Social Graph in a way that every person be able to constantly broadcast all their activities to a network of contacts and friends on the website; that is when social web is created (a somewhat crude description of what social web really is). Social Web is a generic name for all kinds of Social Networks used for Networking, Intranet, Project Management, Citizen’s Journalism, or online commerce. The building blocks of a social network are: Nodes + Graphs + Stories. Nodes are the People, Groups, Organization Pages, images, videos. The Social Graph defines the relationship amongst the nodes. Stories are generated by some of the nodes and they propagate around in this network of nodes and graphs through the direction defined by the social graphs. When the Node A connects to the Node B using a social graph, it is in fact subscribing to the activities of Node B. Node A could be a person, and Node B could either be another person, group, picture or a video. All the nodes in a social network are often commentable or taggable. I like to think that the supper connectivity of Social Networks have revolutionized our lives the same way that railways did after the invention of the steam engine. Information flows freely on the social networks and attempts to censor and control the flow of information faces major challenges because of the distributed nature of social networks. A distributed system is inherently more immune to control attempts of a centralized authority. Developing Social Websites and Social Networking websites falls in the domain of Software Developers and Web Application Architects as well as the people who collaborate with them to nurture and grow all sorts of online communities. Unlike traditional content website development projects, developing social networks are often open ended and multi-stage projects and require hands-on skills that is obtained through real life experience and well developed intuition. 1st Generation – Static Websites: static web pages done by hand-coding html pages or using html authoring tools. 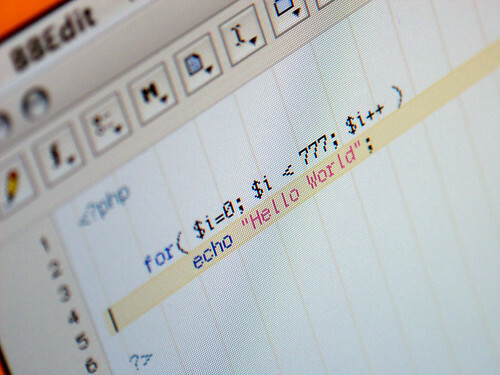 2nd Generation – Dynamic Web Pages: web page creation is automated using scripting languages such as Perl, PHP, etc. Read/Write Web (Web 2.0): all or most of the signed-in users can Browse, Read, Edit, Add, and Delete (BREAD) Content. Social Web and Social Networks: relationships are maintained amongst the signed-in users and media content (social graph). 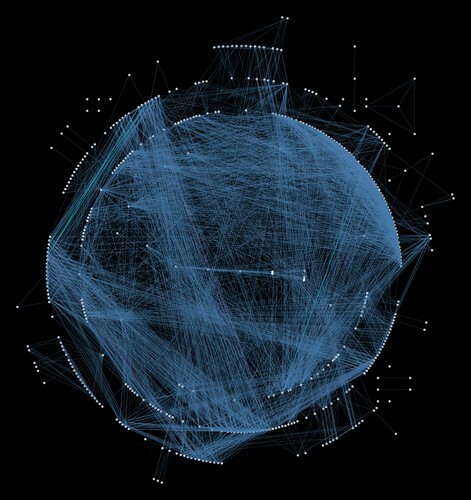 News and stories propagate throughout the social graph to different people. These updates are often complied as activity feeds or story feeds. Rastin, I really like this thoughtful perspective on the evolution of websites. There are a few of technologies and stages that might be added to the list. Here are some I remember. When designers tried to create beautiful HTML sites, the solution for complex layout was to use (mis-use) tables. Software developed to facilitate this resulted in (sometimes) attractive sites that clients loved when presented by the designer, not on the web but on a local machine. The sites would have looked lovely, if they had worked. For many users actually trying to view the sites, the material arrived at a painfully slow pace. I think that clients often didn’t know how frequently browsers, seeking fast satisfaction, just moved on. Do we need to mention Flash and all of those time-traps on the entry page – loved only by the client and loyal friends? The Internet search technology has had a great impact on site design (or should have). In the early days, to be effective with the crawlers it was enough to be sure that pages were well annotated in the header with keywords and content description. That all changed when Google and others ranked pages with the volume and quality of incoming links. The current game of seeking to have a community of linked sites, I think, is part of the attraction of certain aspects of social media. Most people still don’t know that the power of blogging (especially for business) has to do with the nature of blogs, not just as sites for personal expression, but as whole communities of connected bloggers. This was a feature of blogs even back when it was the realm mainly of geeks. My experiments show that Google gives an amazingly high rank to a new blog article… which then fades in time (so, keep posting!). 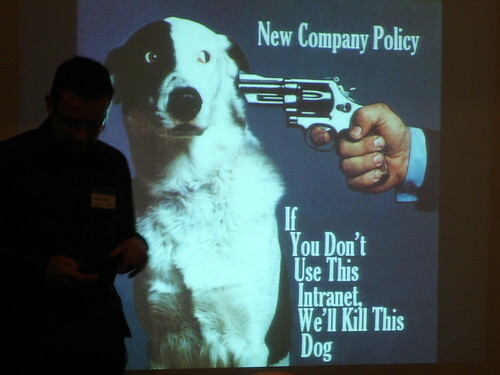 Intranets have been around since the days of Bulletin Boards. One piece of software that has been outstanding is Firstclass. Members at a FC site have known most of this ‘social media’ experience since the mid-90s: easy-to-setup countless threaded forums, easy online chat among members, FC is also a full POP server so every member has full email to the rest of the Internet (plus added email features within the site), every member can have their own web site… but if managing HTML is complicated, every member has a folder where any files dropped in it appear on that member’s web location as an clickable and downloadable list (much easier than FTP for big files, and fast!). The FC technology was developed in Canada, it has been a true pioneer in social media, but the software has been sold several times, and, I believe, due to terrible marketing, never saw its potential for growth. Just because this is a bit of an historical perspective, at the time the web appeared, many watchers were expecting the experience of navigating Internet sites in a 3-D space would be achieved by Gopher. In those days we all found goodies on the Internet with FTP and Gopher. I still remember the night that I downloaded Mosaic, the first web browser. Until then I’d seen the web as an interesting use of hypertext… but that night changed everything. Now my 8 and 9 year old daughters skype me at work, sending me emails and update our family intranet. Forums have been an effective social “node” since the days of BBS. (I logged into a lot of Wildcat sites.) But forums are very self contained. The info that’s in a forum pretty much stays in a forum. It’s pretty obvious that a new social web has evolved and is continuing to evolve. Apparently tagging has moved beyond blogging. I haven’t been involved with blogs: I’ve been doing forums and Joomla. Tags are something that has come out of WordPress, etc. The little bit of experience I had with WordPress showed me they had a very effective method for sharing information between bloggers. It’s been in the back of my mind that I needed to figure out what that was they were doing, because I could see it was good. So that’s what Social Web is about, apparently. Using tags in more places than just blogs, to connect people, groups and events. Right? Well, that’s very cool. Thank you for the info!